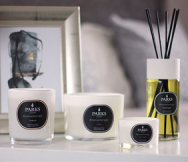 Sweet, nourishing and uplifting, the Linden Blossom, Mimosa & Magnolia Luxury Perfume Diffuser from Parks will fill your home with the caring and soothing scent of mimosa and floral blossom ¬– a charming home fragrance that will lift your spirits on even the dreariest of days. Few scents deliver rich floral fragrance like linden blossom. Sourced from the linden tree, which is found across Asia, North America and parts of Europe, this fragrant blossom is one of the world’s best-loved floral scents, and is regularly used in luxury perfumery. Linden flowers produce a sweet and distinctive floral aroma that’s light, elegant and soothing, making it the perfect scent for a wonderful home fragrance diffuser. Accompanying pure natural linden blossom extract is mimosa and magnolia, two floral scents which share the blossom’s light, summery fragrance. Together, these wonderful extracts create a complex and refined floral bouquet, and one that’s both elegant and spirit-lifting. Our delicate blend of linden blossom, mimosa and magnolia is one of the signature scents in our exclusive Aromatherapy collection – a series of carefully-developed home fragrances that combine ingredients that are renowned for their relaxing and mood-enhancing properties. Balanced and satisfying, this special floral fragrance can help you unwind and find peace after a long and exhausting day. Featuring 100ml of slow-evaporating diffuser oil and a handful of natural rattan sticks, our Linden Blossom Luxury Perfume Diffuser offers up to 8 weeks of delicate home fragrance – so you can savour this memorable scent for longer.